Slightly cheaper than gearbest and a bit quicker delivery from my experience. Also 10% discount coupon new members. Are there any of these which isn't a screw fit bulb and more like a …Are there any of these which isn't a screw fit bulb and more like a standard home light fitting connection? No. Screw fitting only. Adapters available very cheaply from the likes of Amazon, ebay, Ikea etc. Have to say, we have replaced our own white ceiling pendants with rather posh, chrome-plated E27 ones and it makes you realise how utterly behind the times our bayonet fittings truly are!! Are there any of these which isn't a screw fit bulb and more like a standard home light fitting connection? I'm guessing any Bayonet to E27 connector will work? I got mine from Bangood also. No. Screw fitting only. Adapters available very cheaply from the likes of …No. Screw fitting only. Adapters available very cheaply from the likes of Amazon, ebay, Ikea etc. Have to say, we have replaced our own white ceiling pendants with rather posh, chrome-plated E27 ones and it makes you realise how utterly behind the times our bayonet fittings truly are!! Bayonet fittings are just the worst......the rest of the world has moved on without us. Thanks OP, my first foray into the world of smart bulbs! Is the one that works with Alexa? I placed an order paid by PayPal but no emails from the store or PayPal..
I’m guessing this is under the limit for custom charges when it hits my door? I’m guessing this is under the limit for custom charges when it hits my d …I’m guessing this is under the limit for custom charges when it hits my door? I’ve ordered about 10 of these bulbs now over the course of the year and had no issues at all. £9.09 on Heartbeat for me. Which country does these come from. If we a buy a few in one order, would thr be customs charges or something we wud have to pay on delivery. Also the 10%code doesn't seem to work on discounted items. £1.15 if you buy one or two, £0.97 if you buy more. You can also bring it down with multiple coupons. 10% for new registrations on mobile app and many others coupons work too! Do they do an RGB light with speaker that works with Alexa ? My nephew has one but thats Bluetooth but the light function is controlled via an app on his mobile. Took the plunge. I bought an Echo Dot last week: are these easy enough to connect and voice control? Does anyone know which skill you need to sync? Cheers. Took the plunge. I bought an Echo Dot last week: are these easy enough to …Took the plunge. I bought an Echo Dot last week: are these easy enough to connect and voice control? Does anyone know which skill you need to sync? Cheers. Guys, you will love these! Order took a few weeks to arrive, its great to be able to select any colour from 16 million or so. 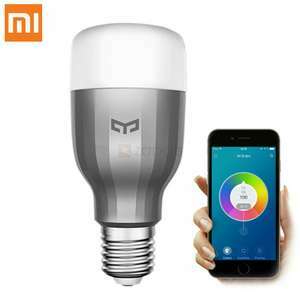 The manual comes in Chinese, but you should be able to work it out once you have downloaded the app and configured the bulb to use your Wifi. / password etc. Ordered 3 of these 6 weeks ago and still waiting!! Bayonet fittings are just the worst......the rest of the world has moved …Bayonet fittings are just the worst......the rest of the world has moved on without us. I'd like to know design wizard devised a system whereby to install this item made from thin glass you have to apply pressure to the afore-mentioned glass, push up and twist!! Bloody ludicrous. Ordered 3 of them just for testing. Thanks OP! from experince how long do bangood usually take? Will I be able to control these with Alexa as well as control my hive lights I got free with the British gas offer? If I have hive lights and yeelights in same room will it be OK? 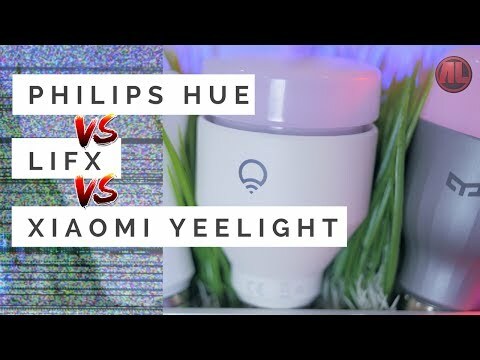 I don’t want Phillips Hue because it means another Hub as I have Hive already for my heating.